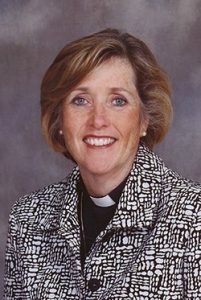 Thorneloe University is thrilled to announce that its Chancellor, Archdeacon Anne Germond, has been elected the 11th Bishop of the Diocese of Algoma. Archdeacon Germond was elected on the sixth ballot at the Cathedral of St. Luke in Sault Ste. Marie on Friday, October 14, 2016. Archdeacon Germond was just recently installed as the seventh Chancellor of Thorneloe University. She is currently Rector of the Church of the Ascension (Anglican) in New Sudbury, where she has served since 2000. Married to Dr. Colin Germond, Rev. Germond is also Archdeacon of the Sudbury-Manitoulin Deanery in the Diocese of Algoma. She is a graduate of Thorneloe University’s School of Theology and has served on Thorneloe’s Board of Governors since 2002. Archdeacon Germond will be consecrated and installed as the 11th Bishop of the Diocese of Algoma in February. The Diocese of Algoma is part of the Anglican Church of Canada. It spans nearly 182,000 kilometers and includes the regions of Thunder Bay and the north shore of Lake Superior, Sudbury, Manitoulin Island, North Bay, Muskoka, and Sault Ste. Marie, where the Cathedral and Diocesan Offices are located. Thorneloe University has offered academic programming in the humanities for more than 50 years. As a founding member of the Laurentian University Federation, on the campus of Laurentian University in Sudbury, Thorneloe is home to the departments of Ancient Studies, Theatre and Motion Picture Arts, Religious Studies, Women’s, Gender, and Sexuality Studies, as well the Thorneloe University School of Theology.